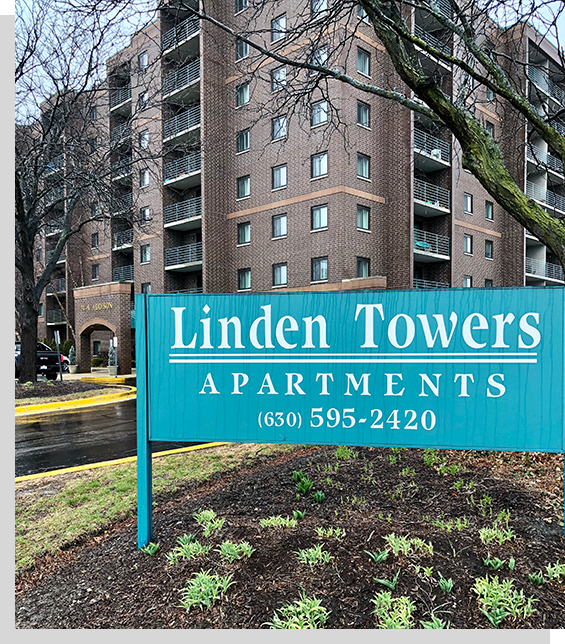 Linden Towers stands in the heart of Bensenville, a 100 year old community which has successfully preserved its country flavor while growing economically with a blend of residential, commercial, and light-industrial neighborhoods. The historic character of the village may be seen in the Old Green Street School and “Old Bensenville,” an area of lovingly cared for homes in the vicinity of Center, Addison, and Green Streets. White Pines Country Club, with its year round golf and economical yearly pass, the public library, and the Bensenville Community Center offer recreational, research, education, and civil involvement opportunities. A variety of churches, schools, and daycare centers are within walking distance of Linden Towers. Fourteen community parks provide miniature golf, swimming, water park activities, softball, football, soccer fields, ice skating rinks, basketball and tennis courts, skate parks, playground equipment, and picnic sites. Convenient local and regional public transportation is available to residents of Linden Towers. The Metra train station is a short stroll from your front door. This rail line links downtown Chicago with Elgin and provides access to Metra’s swift, comfortable service throughout the greater Chicagoland area. Bensenville’s RTA bus system is both economical and convenient. Major routes provide service to Chicago, northwest suburbs, and western suburbs. A regular in-town bus line meets local travel needs and “dial-a-bus” provides local door-to-door service. The location is also advantageous for driving. Linden Towers enjoys close proximity to three major thoroughfares: York Road, Kingery Highway (Route 83), and Irving Park Road. You may select from three expressways (I-290, I-90, I-294) to visit downtown Chicago. Diverse retail establishments lie just north of Linden Towers. For your convenience, Linden Towers includes a ground floor retail business area within the complex. Lifestyle advantages are not limited to neighborhood and area benefits. Each Linden Towers apartment offers an impressive list of “standard” amenities which includes a clothes washer and dryer. A community entertainment room with bar, kitchen, bathroom, and furnishings is available to all residents. Apartments on the seventh and eighth floors feature fireplaces. Car owners also enjoy the added convenience of adjacent, covered parking.